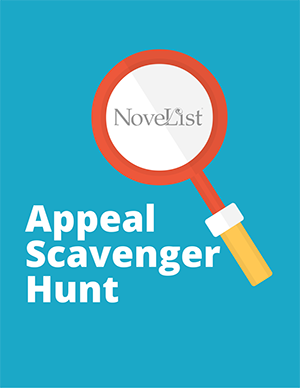 NoveList Appeal factors help readers decide whether or not a book fits their style or mood. What is “heartwarming” to one reader may be saccharine to another; what is “mildly sensuous” to you may be quite shocking to others. These resources will help you get started finding the right books to appeal to every reader. The Secret Language of Books: A Guide to Appeal – *Newly updated 2017 edition* This useful little pocket guide defines the words that describe the mood of books. It’s a must-have tool for anyone who works with readers. Webcast: Appealing to Genre Readers – Listen to a panel of reader’s advisory experts as they discuss strategies for going beyond genre read-alikes and using appeals to *ahem* appeal to avowed genre readers. Searches all categories of appeal (e.g. type “AP Approachable” in the search box). Uses a keyword search for genre so searching “GN mystery stories” will return titles tagged with that genre. Returns all books, authors, and series with the subject (e.g. try a search for “SU Dogs” or “SU 1950s”). Performs an exact numeric search for a Lexile. Search a range using < and >. For example, “LX > 500 AND LX < 700″.